With applications throughout the social sciences, culture and psychology is a rapidly growing field that has experienced a surge in publications over the last decade. From this proliferation of books, chapters, and journal articles, exciting developments have emerged in the relationship of culture to cognitive processes, human development, psychopathology, social behavior, organizational behavior, neuroscience, language, marketing, and other topics. 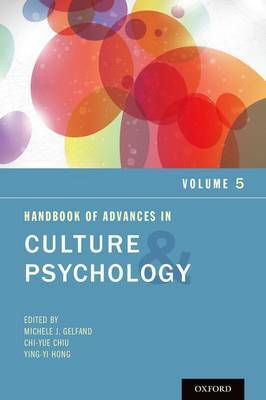 In recognition of this exponential growth, Advances in Culture and Psychology is the first annual series to offer state-of-the-art reviews of scholarly research in the growing field of culture and psychology. The Advances in Culture and Psychology series is: * Developing an intellectual home for culture and psychology research programs * Fostering bridges and connections among cultural scholars from across the discipline * Creating a premier outlet for culture and psychology research * Publishing articles that reflect the theoretical, methodological, and epistemological diversity in the study of culture and psychology * Enhancing the collective identity of the culture and psychology field Comprising chapters from internationally renowned culture scholars and representing diversity in the theory and study of culture within psychology, Advances in Culture and Psychology is an ideal resource for research programs and academics throughout the psychology community.